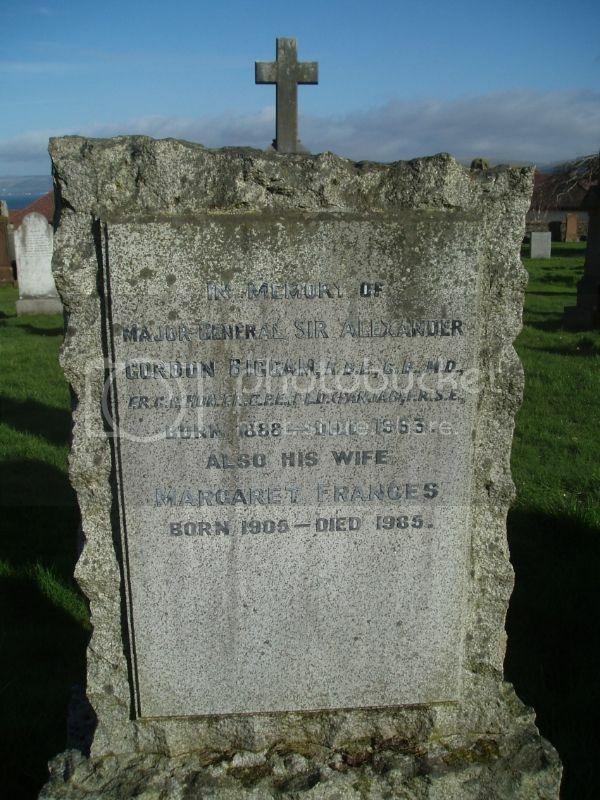 Additional information: Son of Mr. and Mrs. Hugh McCrea, of 35, High St., Stranraer, Wigtownshire. 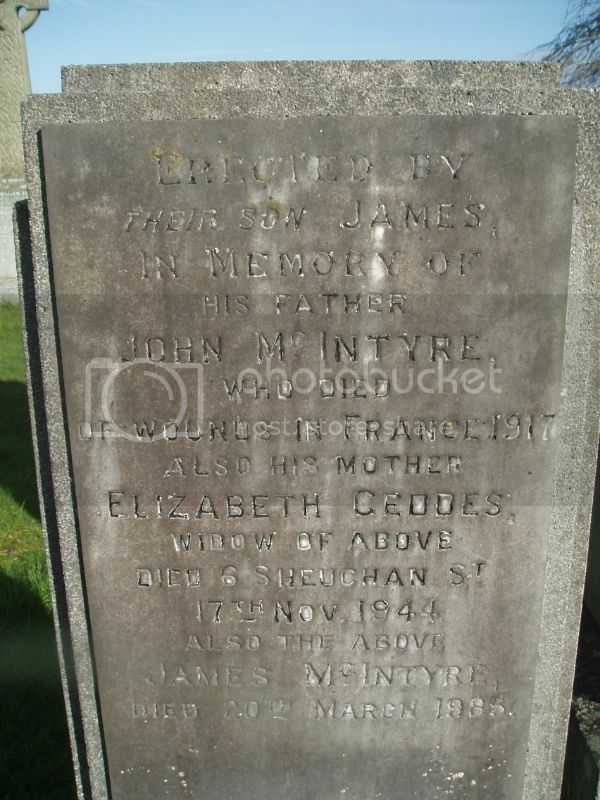 Additional information: Husband of Elizabeth Geddes McIntyre, of 9, Foundry Lane, Stranraer. 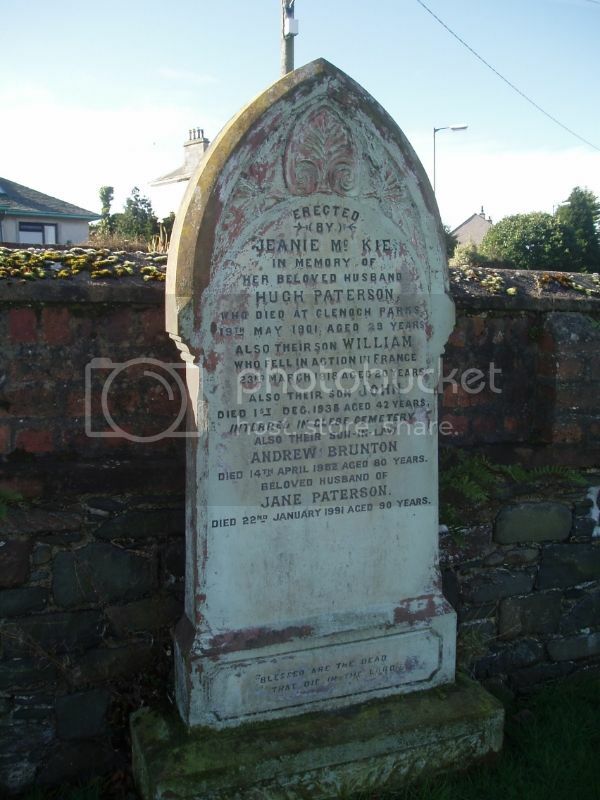 Additional information: Son of John and Agnes McWhirter, of 1, Birnam Place, Stranraer, Wigtownshire. 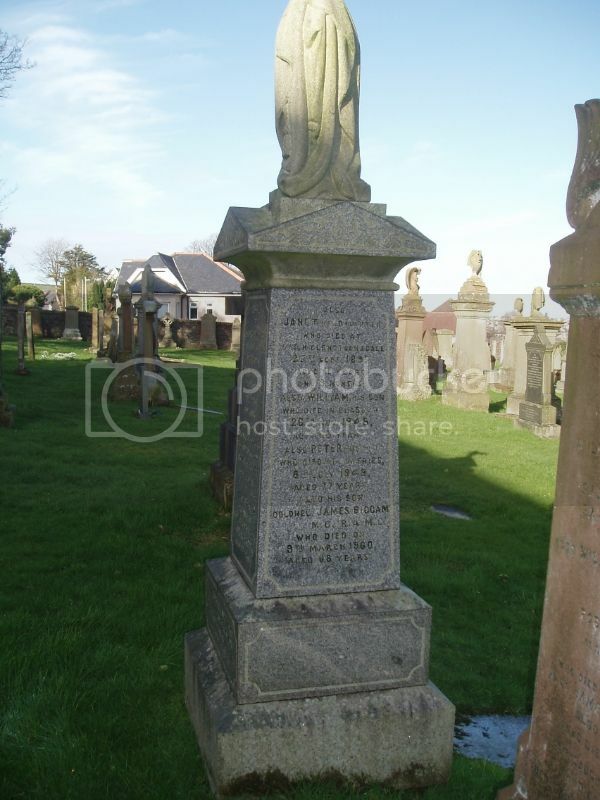 Also named on Stranraer Parish Church memorial and on Stranraer Burgh War Memorial. 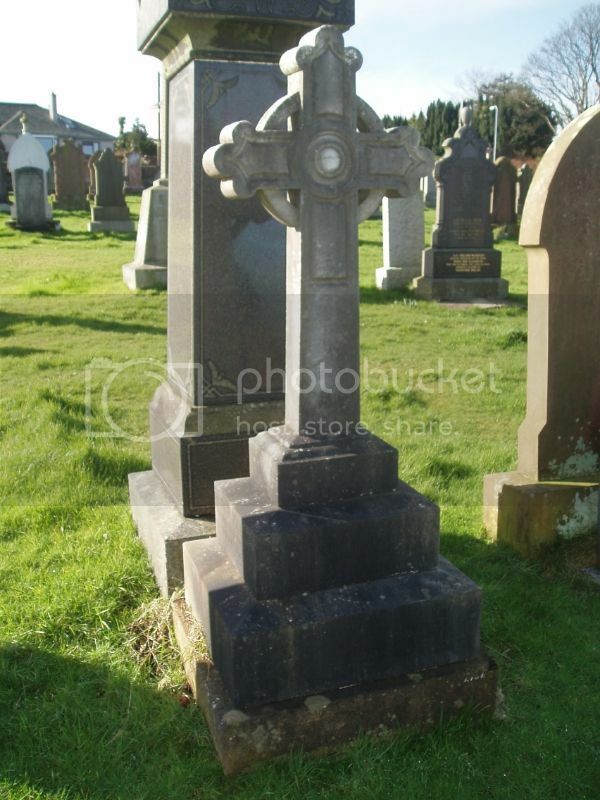 Additional Information: Son of Mrs. Ellen Neil, of 11, Sheuchan St., Stranraer, and the late Hughes Charles Neil. Wigtownshire Free Press (26/7/1917): Mrs Neil, 11 Sheuchan Street, Stranraer, has received intimation that her youngest son, Sapper Gilbert Neil, RE, was killed in action on 9th July, after serving nineteen months in France. 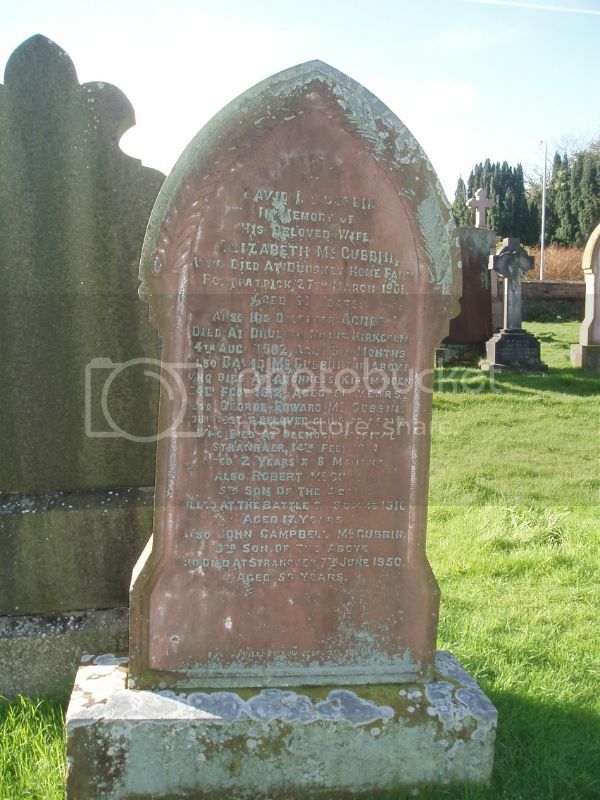 Sapper Neil, who was 22 years of age, was employed with Mr John Forsyth, plumber, Stranraer, before he enlisted. 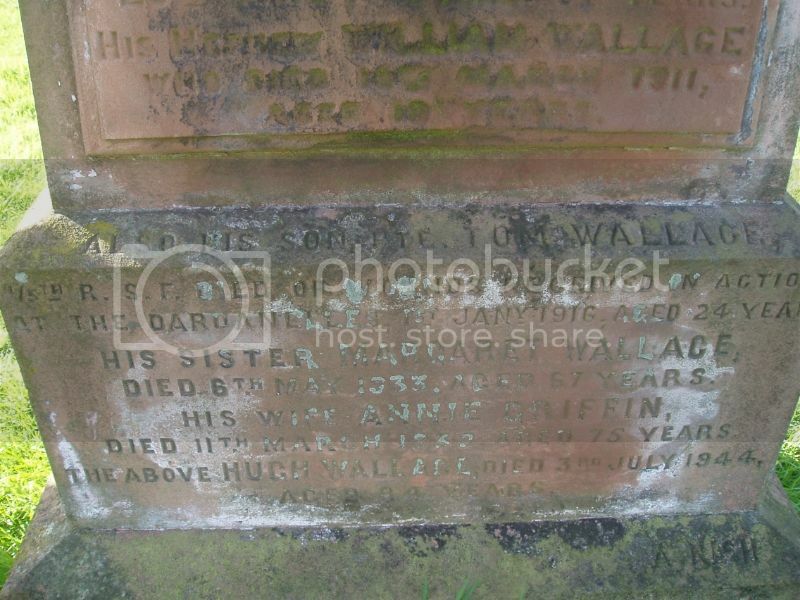 Additional Information: Son of Helen Neil and the late Hugh Neil. 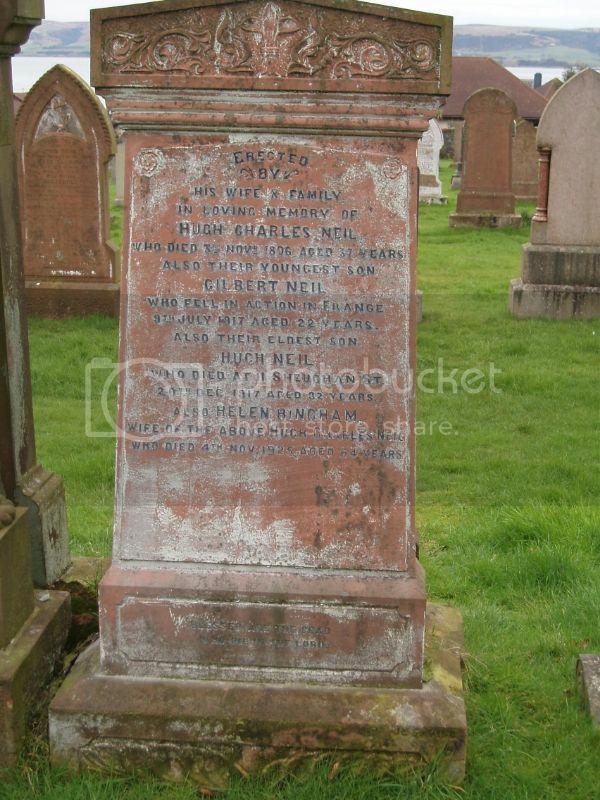 Hugh Neil is commemorated on both Wigtown and Stranraer War Memorials. Born 18 Aug 1886 he joined the Army Service Corps (Service number 170788) but was discharged in 12 September 1917 with tubercolosis. His discharge papers stated that this was not the result of, but aggravated by, ordinary military service. 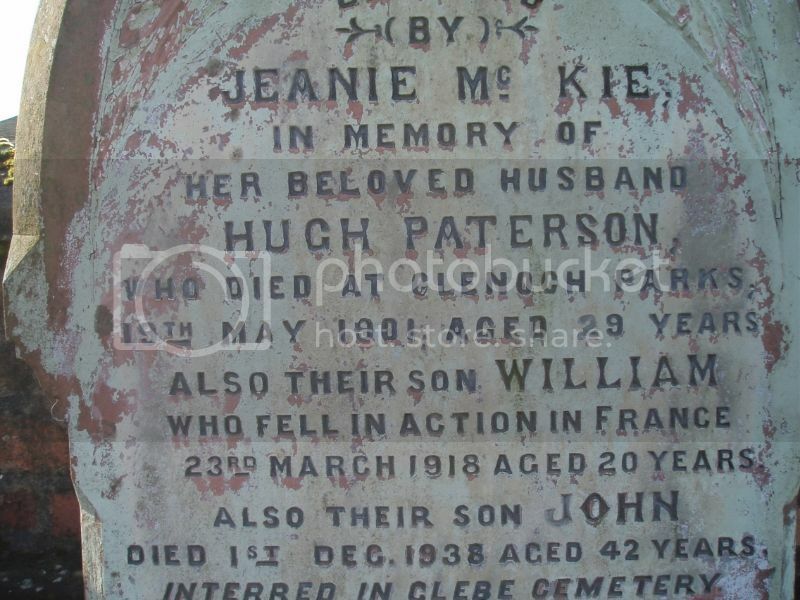 He died on 27 December 1917 at the family home in Stranraer. 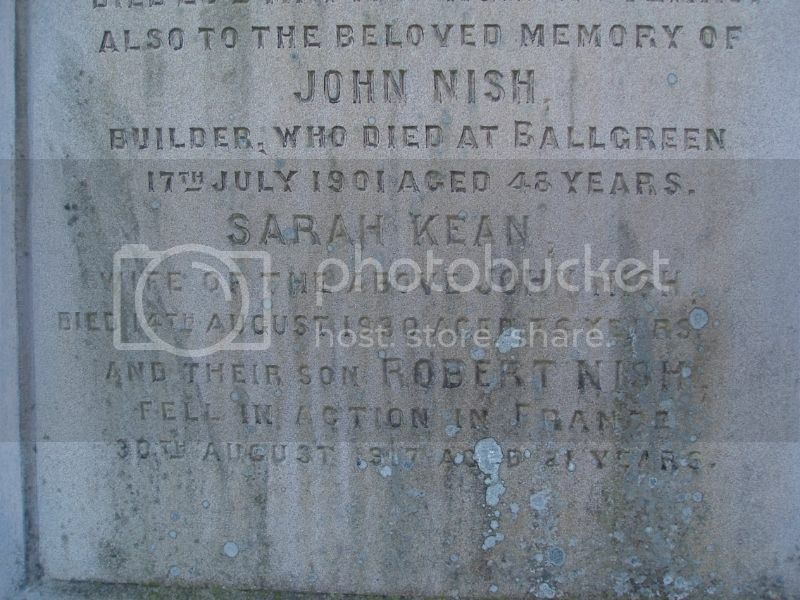 Additional information: Son of John and Sarah Nish, of Hanover Square, Stranraer, Wigtownshire. Wigtownshire Free Press (13 September 1917) carried a photograph of Private Nish and reported: Mrs Nish, Hanover Square, has received official intimation that her youngest son, Priate Robert Nish, RSF, died of wounds received in action on August 25th. Private Nish enlisted when the war broke out, and was drafted to Salonica, where he contracted dysentry, and was invalided home. After recovering, he was sent to France. 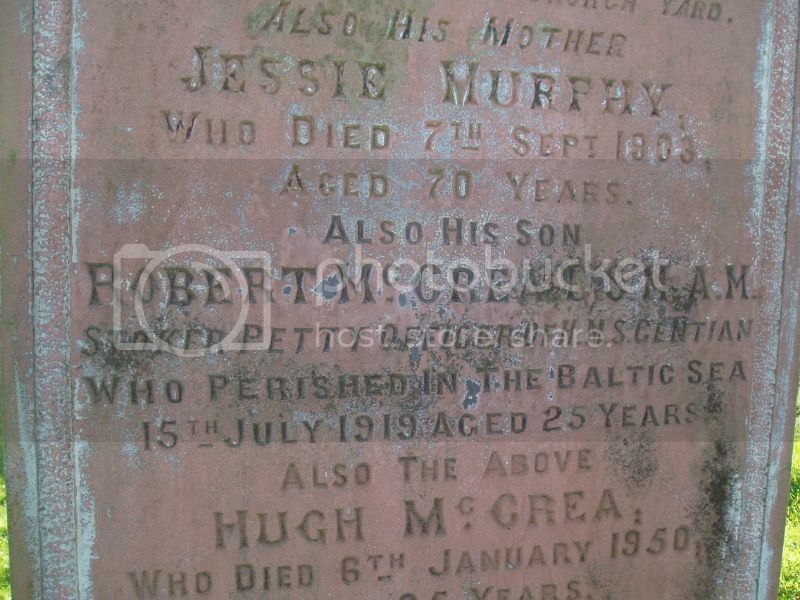 Prior to enlisting he was employed as a grocer with Mr H McDowall, Stranraer. Note discrepancy over date of death. 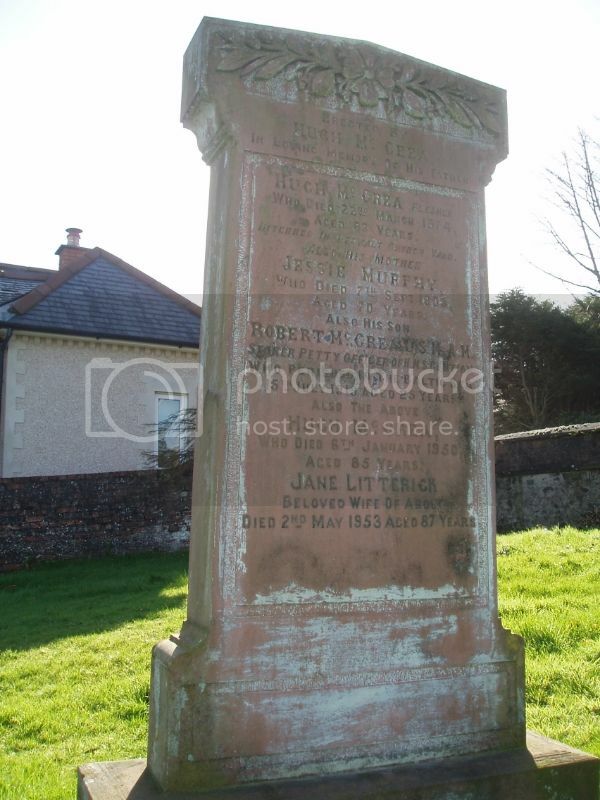 Also named on Stranraer Burgh and Stranraer Parish Church War Memorials. Additional information: Son of Mr. J. 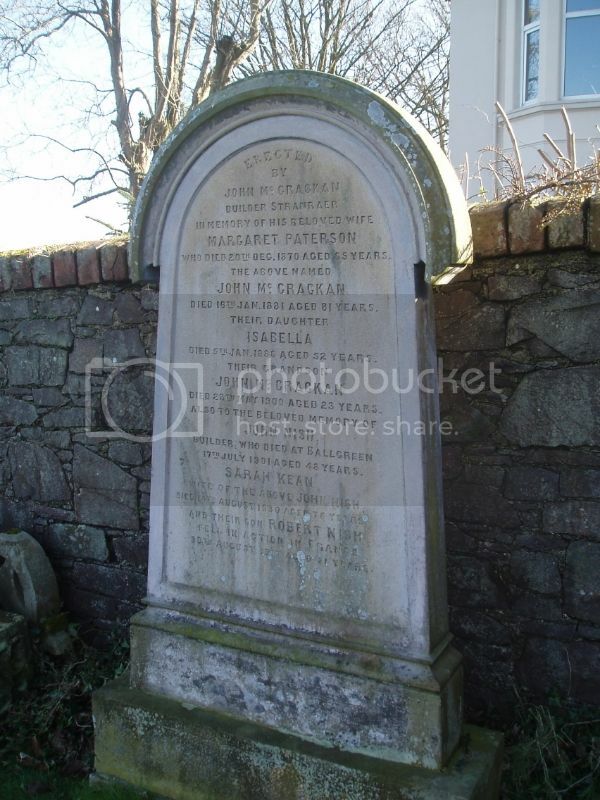 B. Ormiston, of Waverley House, Stranraer, Wigtownshire. 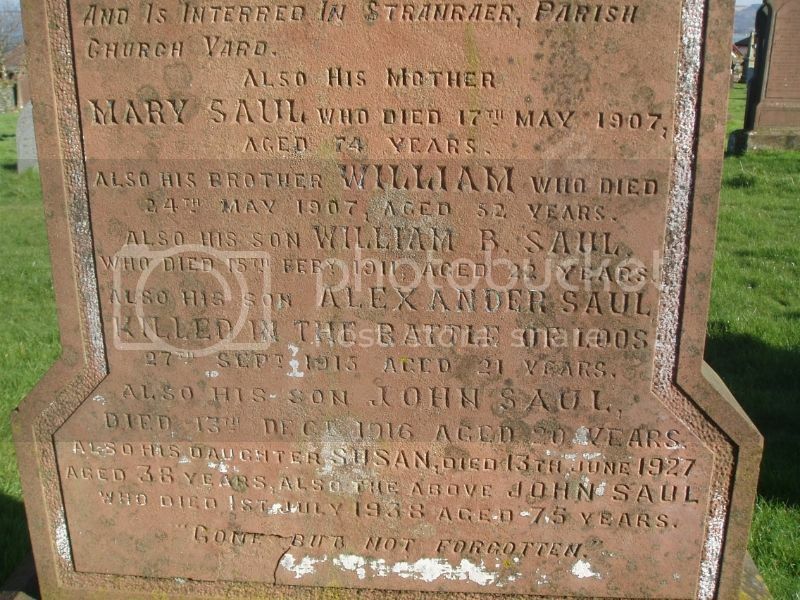 Additional information: Son of John and Mary Saul, of 42, Shenchan [Sheuchan] St., Stranraer, Wigtownshire. 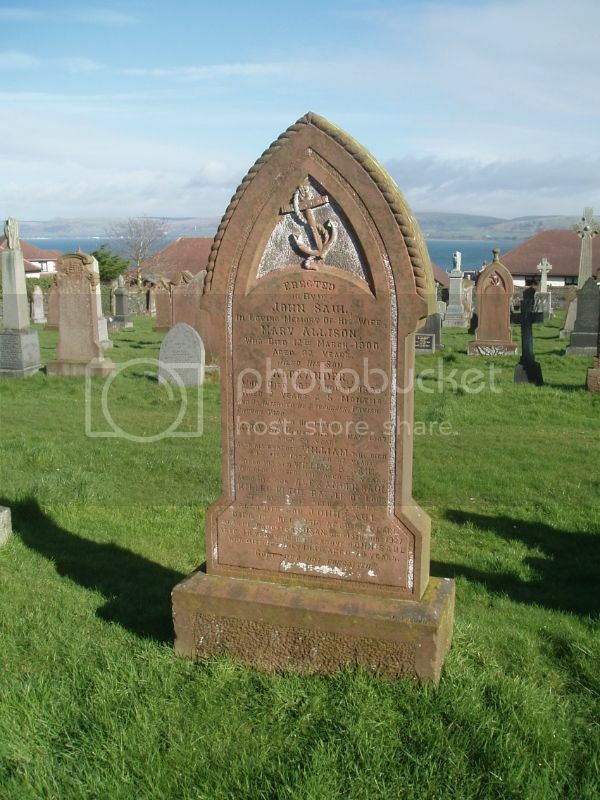 Also named on Stranraer Burgh and St Margaret's Church War Memorials. 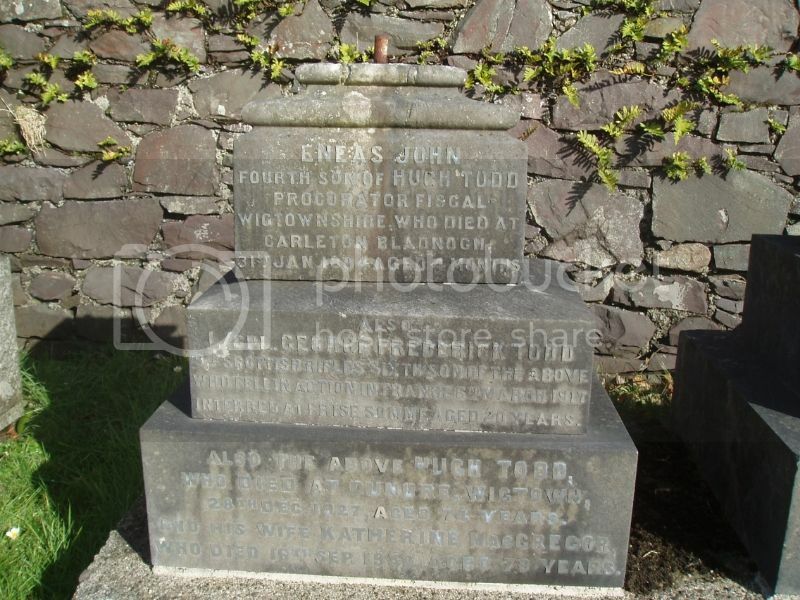 Additional information: Son of Hugh Todd, of Dunure, Wigtown, Scotland. and William Todd, Royal Army Medical Corps. 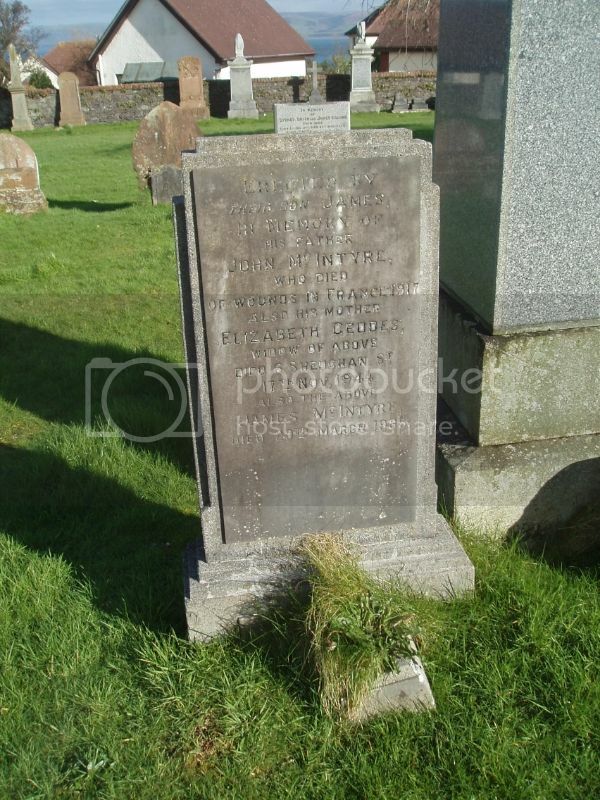 George Todd was one of five Todd brothers from Wigtown who served in World War One. Hugh Todd Jr, a Newton Stewart solicitor, joined the Scottish Horse; Dr William Todd joined the Royal Army Medical Corps; Norman Todd returned from India to join the Middlesex Hussars; and Arthur Todd joined the Australian Imperial Force. 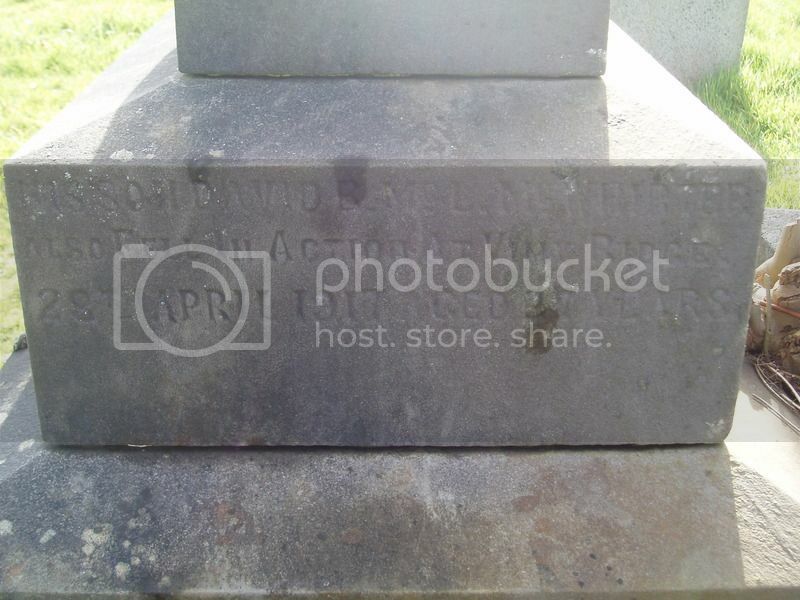 George is commemorated on Wigtown War Memorial. After the war Arthur and Norman returned to Australia. Hugh Jr became Procurator Fiscal like his father. 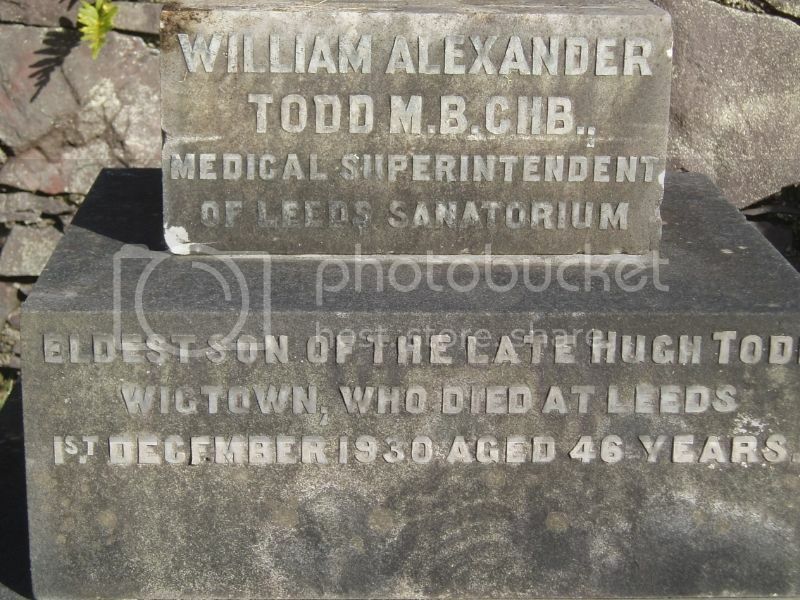 William, whose headstone is next to George’s, became medical superintendent to a Sanatorium near Leeds - he contracted TB and died in 1930. 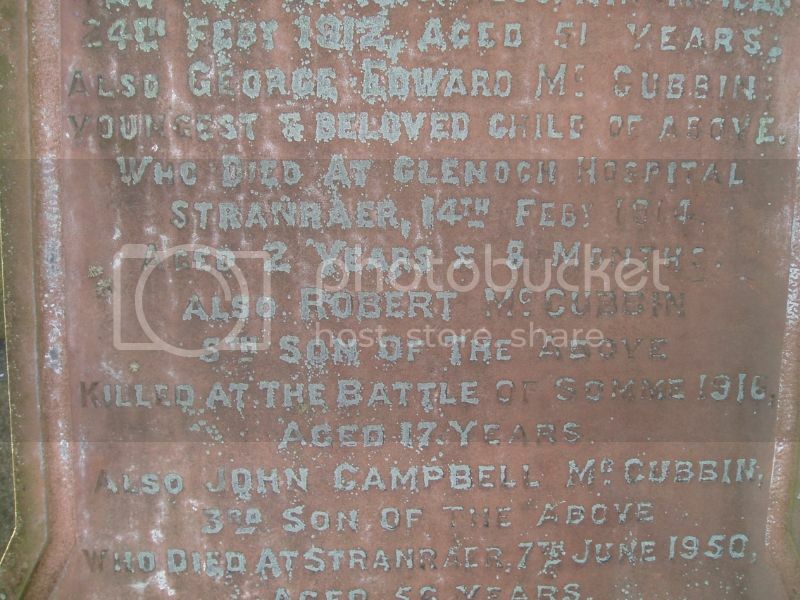 Additional information: Son of Robert and G. Twiname, of Torhousemuir, Wigtownshire. 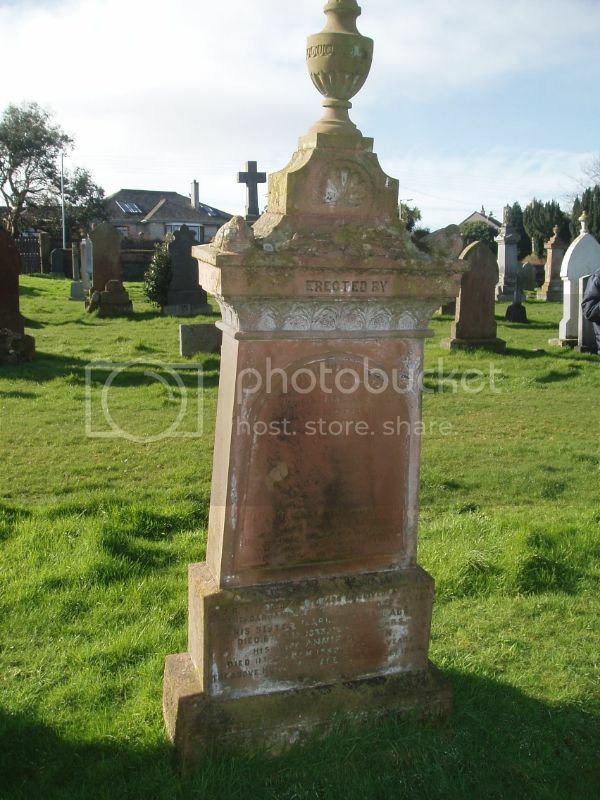 Additional Information: Son of Mr. and Mrs. Hugh Wallace, of 36, High St., Stranraer, Wigtownshire. 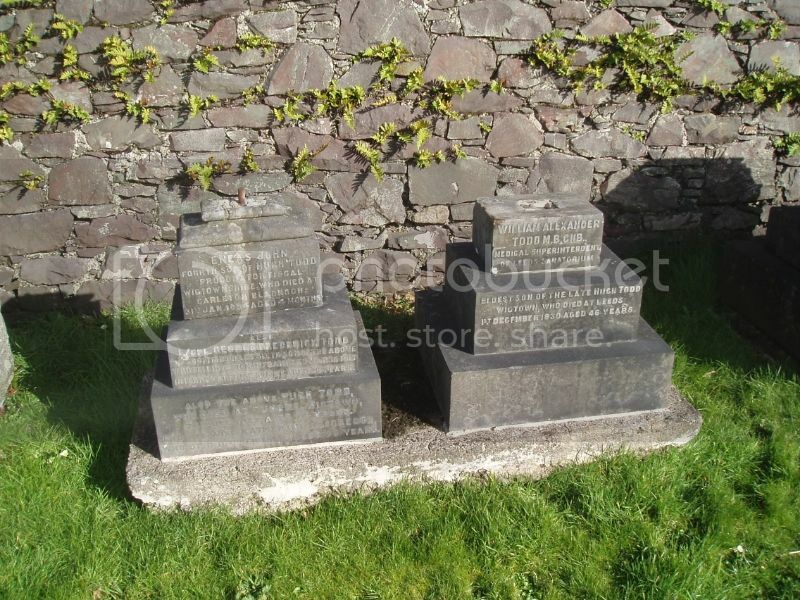 Also named on the war memorial in Sheuchan Church and on Stranraer Burgh War Memorial. 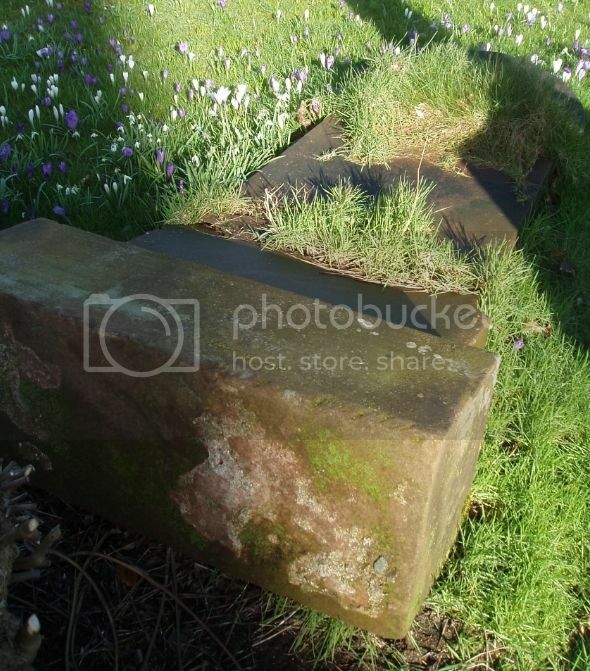 When we visited the cemetery we could not see the headstone. 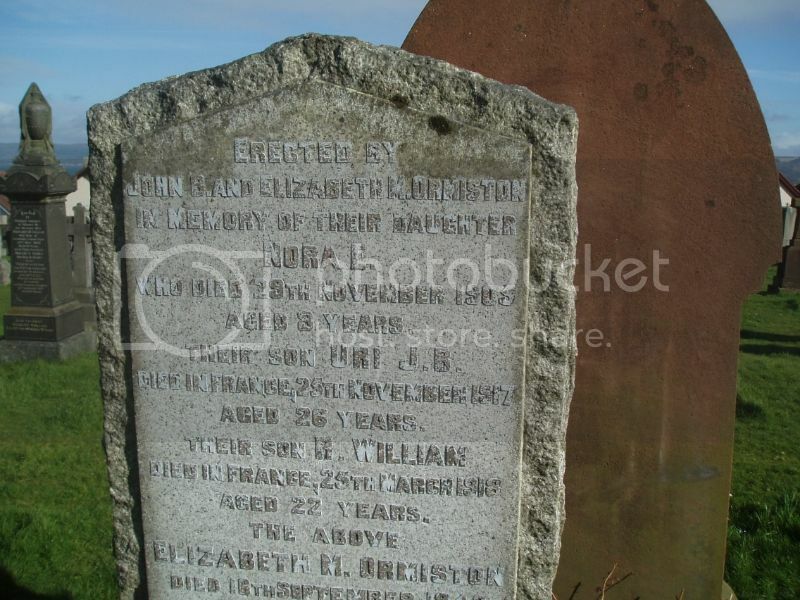 However, a survey by the Dumfries & Galloway Family History Society transcribed it and pinpointed it on a map. 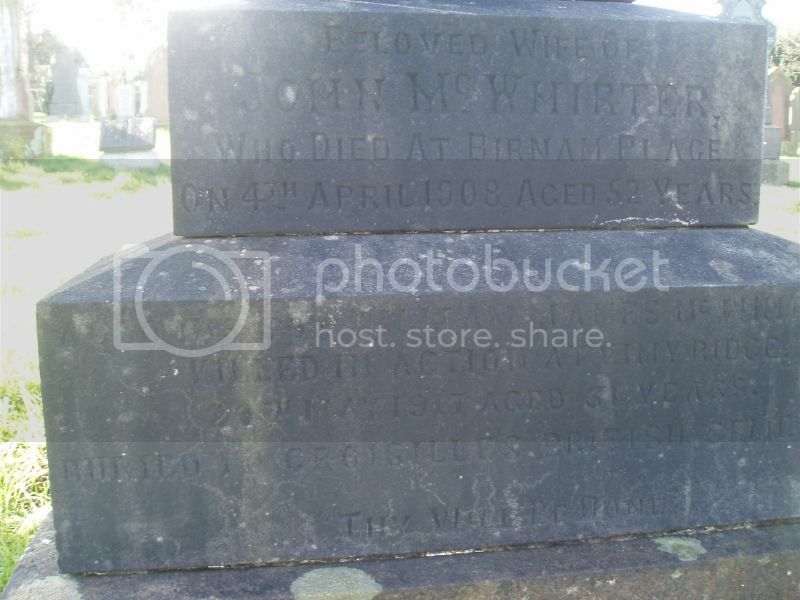 The photograph of the fallen headstone below is taken at the exact spot identified on the map. Unfortunately it was face down so absolute confirmation was not possible. 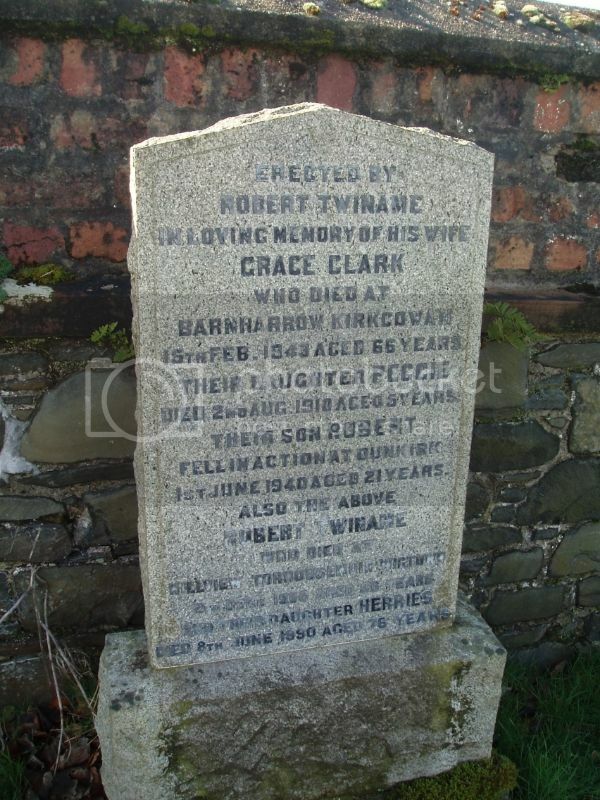 Also named on the Stranraer Burgh War Memorial and on the one in Sheuchan Church. 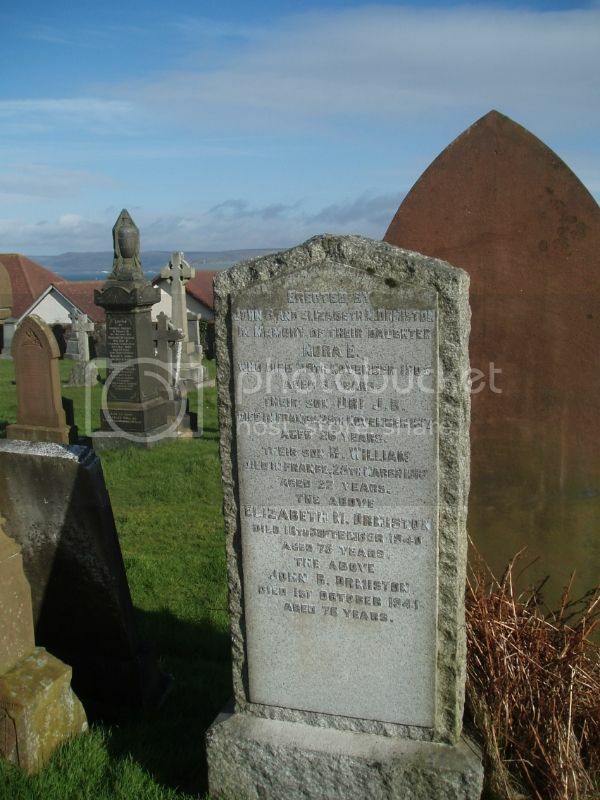 (Information courtesy of Wikipedia): Major-General Sir Alexander Gordon Biggam KBE CB FRSE FRCPE FRCP (14 April 1888, Stranraer - 22 March 1963) was a Scottish physician and soldier who served as Director of Study of Edinburgh Post-Graduate Board for Medicine. Educated at George Watson's College, Edinburgh, and Edinburgh University (MB ChB, 1911; MD 1924) Biggam started his career as a House Physician and Surgeon at Edinburgh Royal Infirmary. In 1912 he was commissioned in the Royal Army Medical Corps and saw active service in France during World War I, where he was wounded in 1915. He then saw service in India from 1916-21. He was awarded the OBE for services with the Waziristan Field Force (1919–21) on the North-West Frontier of India. Biggam was director of the medical unit at Kasr-el-Aini Hospital in Cairo, and Professor of Clinical Medicine at the Egyptian University (1926–33), for which he was awarded the Order of the Nile 3rd class. He served as examiner in medicine for the Kitchener School of Medicine in Khartoum and the American University of Beirut. He was appointed an honorary physician to King George VI in 1937. Biggam served in India and Burma during World War II and was Consulting Physician to the Army during 1941-7. He was made a CBE in 1940, appointed a CB in 1944 and appointed KBE in 1946. After the war he returned to Scotland, taking up the post of Senior Lecturer in Tropical Medicine at Edinburgh University in 1947. He was elected a Fellow of the Royal Society of Edinburgh in 1950, upon the proposal of Douglas Guthrie, John Gaddum, Sir Alexander Gray and Angus Sinclair. (Information taken from obituary in British Medical Journal): Col James Biggam graduated in Edinburgh in 1914 he went straight into the RAMC with which he served until the end of World War Two. In World War One he was awarded the Military Cross and Bar for conspicuous gallantry and devotion to duty and was twice mentioned in despatches. He was seconded to the Egyptian Army. During the Second World War he served in India, Persia and Iraq. He then took charge of the 23rd Scottish General Hospital in Palestine. After military service he worked at Glasgow Eye Infirmary.